Definition: The Electronic Retailing also called as e-tailing or internet retailing, is the process of selling the goods and services through electronic media, particularly the internet. 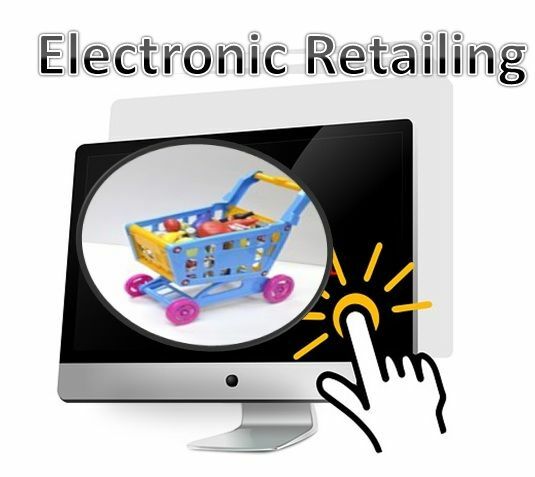 Simply, the sale of retail goods and services online is called as electronic retailing. It follows the B2C business model wherein the business interacts directly with the customers without the involvement of any intermediaries. Pure Play e-retailers such as Amazon, that emerged as the online bookseller. It is present only online and do not have any physical outlet for the customers. Brick and click e-retailers such as Dell, that sells computers through the internet as well as has the physical store front for the customers. Through electronic retailing, customers can save both the efforts and time. The wide range of products is available online, so the comparison can be made easily before the purchase. The huge discounts can be availed while shopping online. The detailed information about the product is available online; that helps the customer to make the purchase decision. The electronic retailing offers the easy payment terms such as payment on delivery that instigate the customer to shop online. The customers may not be sure of the quality of the products offered online. It is the tendency of every individual to bargain before making the final purchase, but this quotient is missing in electronic retailing. Also, the customers may not trust on the payment gateways and fear the misuse of credit cards or any other mode of payment. Every customer wants to see and feel the product that he purchases, but it is not possible in case of electronic retailing where the customer makes the decision just by looking at the image. The product is not readily available; the customer has to wait for some time to get the product in his hands. The customer misses the emotional attachment with the seller that leads to less faith on the offerings. The electronic retailing is the subset of E-Commerce that means, E-commerce is the principle domain that includes the e-tailing operations.